Soil: Thrive in a rich soil. Bloom Time and Color: Lilac flowers intermittently through summer. 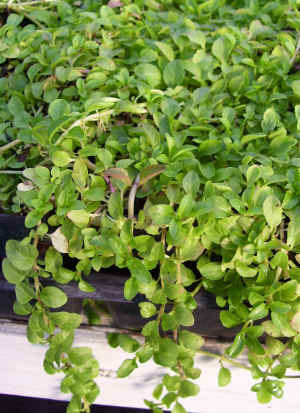 Description: Pennyroyal is the smallest of the mints and very different in habit from any of the others. Semi evergreen with lilac flowers. Extremely powerful scent of peppermint, but not suitable for peppermint tea. This is an excellent plant for areas where ants are troublesome. Good flea repellant. Flowers are fragrant. Good ground cover. Self-sows freely, deadhead if you do not want volunteer seedlings next season. Care: Average water needs, do not overwater.